The Blue River runs for forty-one miles through the Kansas City metro area. The lower and middle sections of the river cover a seventeen mile stretch through Kansas City. This stretch is highly urbanized running through residential, commercial, and industrial areas. In 2014 the Blue River Watershed Association (BRWA) received $59,940 from EPA’s Urban Waters Program to work with its partner agencies to engage eight teams of urban middle school students, four teams this spring and four teams in the fall. BRWA will engage the youth in water quality monitoring studies, data collection, and community presentations and projects. Each team will include a high school or college intern, an educator and a mentor who is a professional in the field of water quality, environmental stewardship, engineering, biology, or a similar field. Before water sampling could begin, BRWA had to submit a Quality Assurance Project Plan (QAPP) which is required by EPA. EPA developed QAPP as a tool for project managers and planners to document the type and quality of data needed for environmental decisions and to describe the methods for collecting and assessing those data. This was new territory for BRWA however, with the help of a board member, Executive Director Lynn Youngblood wrote a successful QAPP. The data collected during this program will be available for use by Kansas City Missouri Water Services Department, EPA, and any other agency in need of water quality data. BRWA completed their first youth orientation and water testing event this spring in the form of the Big Blue Bus Tour. The purpose of the bus tour was to help the youth develop a big picture view of the Blue River. The tour covered ground from the headwaters of the Blue River down to its confluence with the Missouri River. This confluence is rarely seen by environmental scientists let alone community members and Kansas City youth. One of BRWA’s colleagues at the Kansas City Water Services Department received permission for the youth to get out of the bus and actually stand on the banks of the river at this confluence. 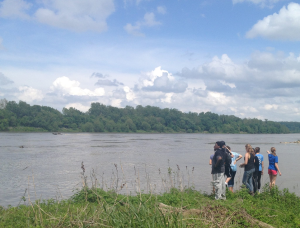 The tour provided lessons on the early history of people living in the area, historic recreational uses, ecology, and the concept of urbanization and how this impacts the Blue River. BRWA held their second water testing event on June 9th. The four teams of youth were at different test sites on the Blue River; each team sampled at the same time (4:00 PM) on the same day. The data collected will generate valuable discussion about the different conditions that exist along the Middle Blue River and provides an opportunity for the youth to learn about how the river is impacted by different land uses and human behavior. The approach being used to engage youth in this program is truly unique. Each student earns a $100 stipend. On top of this every team has a college intern mentor, a corporate mentor, and an education mentor. Most of the college interns are from the University of Missouri Kansas City and are enrolled in environmental studies or urban planning students programs. The education mentors are mostly retired teachers and the corporate mentors represent a variety of professions. The college interns may receive college credit and a $500 stipend and have expressed their excitement about the opportunity to not only work with youth, but have access to corporate mentors. Some of the college interns were born and raised in Kansas City and see this as an important opportunity to engage with youth from similar backgrounds. In addition to having access to college interns and local professionals, the youth teams are tasked with creating a community project. The goal of each project will be to engage the larger community around issues of water quality. They will receive training on how to create a presentation and on public speaking. Partnerships are critical to achieving multiple goals. This project is possible through collaboration involving non-profits (BRWA) Heartland Conservation Alliance, public entities (Kansas City Water Services Department), EPA, local academic institutions, and Kansas City Missouri and Kansas public and private schools. BRWA believes in the notion that if we want to see real behavioral change it stems from the youth. The kids are the ones calling out their parents and family members when they neglect to recycle or when they litter. Understanding the factors that affect water quality enables the youth to inform their family members and community about the role they play in the health of our urban waters. The Blue River Watershed Association (BRWA) is a nonprofit 501(c)3, grassroots community organization that engages Kansas Citizens in protecting and restoring the Blue River Watershed. BRWA focuses its efforts in three areas: community education, environmental stewardship, and strategic partnerships. Their goal is to inform Kansas Citizens about watershed concerns like flooding and poor water quality, and to engage the community in addressing these issues, so that everyone can enjoy the benefits of clean rivers and streams, great recreational opportunities and a healthier, more beautiful Kansas City.